I love a fruity, summer dessert with a funny name! 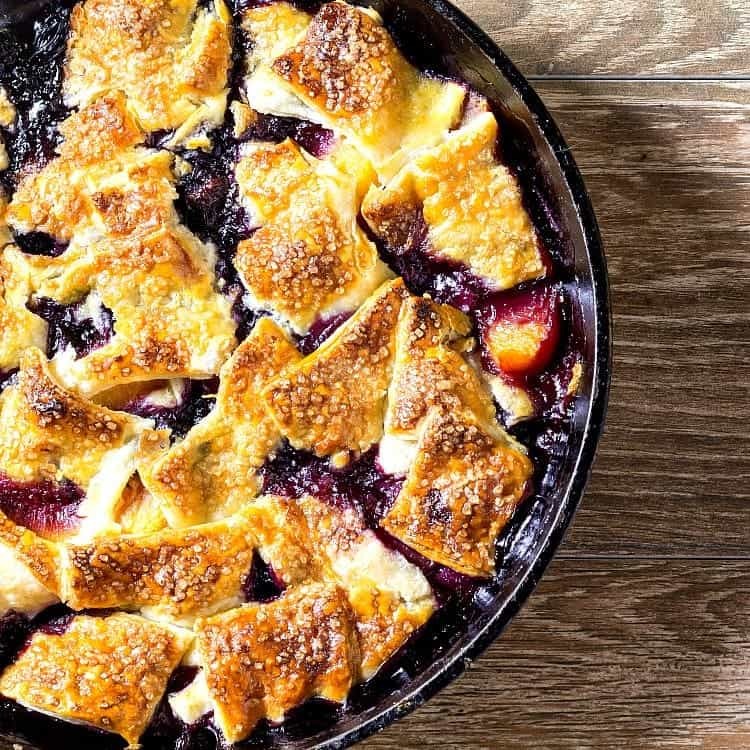 Make this pandowdy by covering juicy fruits with pieces of pie crust. If you’re intimidated by making pie, a pandowdy might be the ticket! 1 What’s a Pandowdy, Anyway? As with many dishes with long histories, nobody is really sure when it first showed up on family tables, but the pandowy–usually made with apples–probably came along at some point in the late 1700’s or early 1800’s. The story is that it’s called a “dowdy” (baked in a pan, I guess, hence pandowdy) because it’s sort of frumpy looking with it’s haphazardly cut pastry top. I honestly have no idea if this is the true origin of the dish, but I do know that if you’re apprehensive about making a crust that you can roll onto filling in one large piece, it’s much easier to just shingle on smaller pieces of dough. So whether or not the original cook meant to make the dessert this way or she just pulled a save out of the ether, this is a great starter pie. We are in the thick of summer here in the south, I decided to forgo the traditional apple filling and work with peaches and blueberries. Fortunately, local blueberries have started to make their appearance. Juicy, ripe, North Carolina peaches are still a few weeks away, so I used frozen. Feel free to use frozen or fresh blueberries and/or peaches. Do use ripe fruit, though, because you’ll need their juices once you dowdy up your crust! I went all in with the pastry in this dessert, pushing some pieces under the fruit before baking and shingling the others on top. The pieces submerged from the beginning are basically little fruit syrup-soaked dumplings. What’s not to love about that? Add to that lovely, fruity, chewy texture some crisp, sugar-sprinkled pieces on top, and this dessert, while a bit homely looking, has a really nice interplay of textures in each bite. Winner! 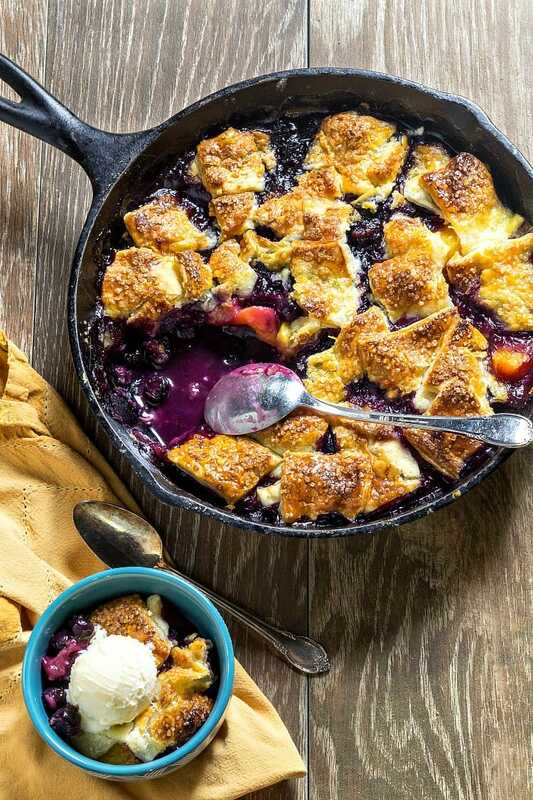 First though, let’s make sure you have what you need to make this peach blueberry pandowdy. The cast iron skillet is the same one I used to make this pandowdy. You already know I don’t want you to live without a bench knife, so go ahead and grab one–you will use it for so much. The tapered pin is my favorite kind of rolling pin, because it’s so easy to maneuver, and the cooling rack is something everyone should have at least one of. I think I own about 8 cooling racks, some round and some rectangular. As always, thank you for supporting PCO by shopping through my affiliate links. And now, let’s make this pandowdy, shall we? 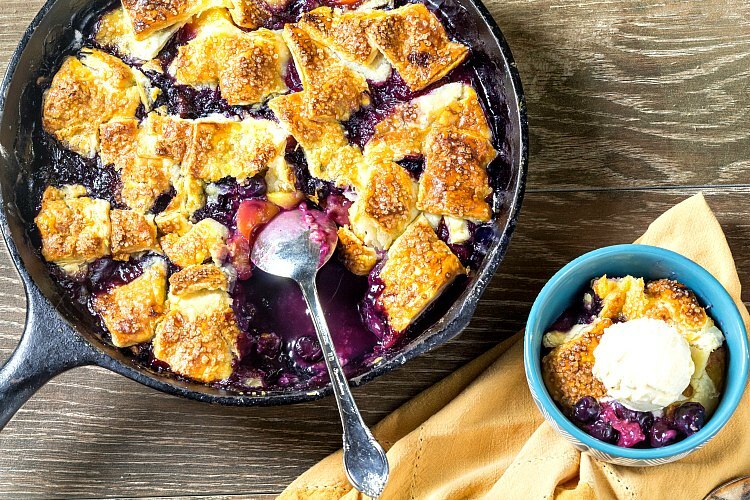 This blueberry peach pandowdy tastes like summer. With buttery pieces of pie dough both tucked into and baked on top of lightly sweetened, spiced peaches and blueberries, this is one dowdy dessert that will be right at home at either a picnic or a dinner party. Place a rack in the center of the oven. Preheat to 425F. Add the sugar, flour or corn starch, spices, lemon juice, vanilla, and salt. Toss everything together evenly. Loosely pile into an 8" cast iron skillet or similar-sized pie plate or baking dish. Roll out the pie crust fairly thinly into a rough rectangle. Generously trim the edges to leave a square of dough. Cut up the trimmings into 2" pieces and tuck 6-8 of these in and under the fruit in the pan. Cut the remaining square of dough into 2" squares and shingle these onto the fruit. Brush the dough lightly but thoroughly with the beaten egg. Sprinkle on the sugar evenly and fairly generously. Bake the pandowdy for 25 minutes. Remove from the oven, and turn the oven down to 375F. With a heat-safe spatula, cut down in between the squares of dough, pressing some of it down into the juices. It might not be super juicy quite yet, but it will be. Don't worry. Bake an additional 35 minutes, or until the pastry is deep golden brown and the juices are bubbling all over the pie--not just around the edges. If some of the pastry is starting to get too dark, cover those areas with some foil. Just keep an eye on things to make sure you don't over-brown your pandowdy. Cool to warm before serving with a scoop of vanilla ice cream, frozen yogurt, or some barely sweetened whipped cream. If you'd like to make the same pastry I did, I made Lazy Baker's Puff Pastry from the cookbook Baking by Hand. (Scroll down quite a way to grab that recipe.) I used 1/3 of the linked recipe, and I've frozen the other 2/3 to use some other time. If you are not using any frozen fruit, your baking time could be 10 minutes or so less, so just keep an eye on your guy and make sure it doesn't over-brown. And there you have it–my homey (homely?) 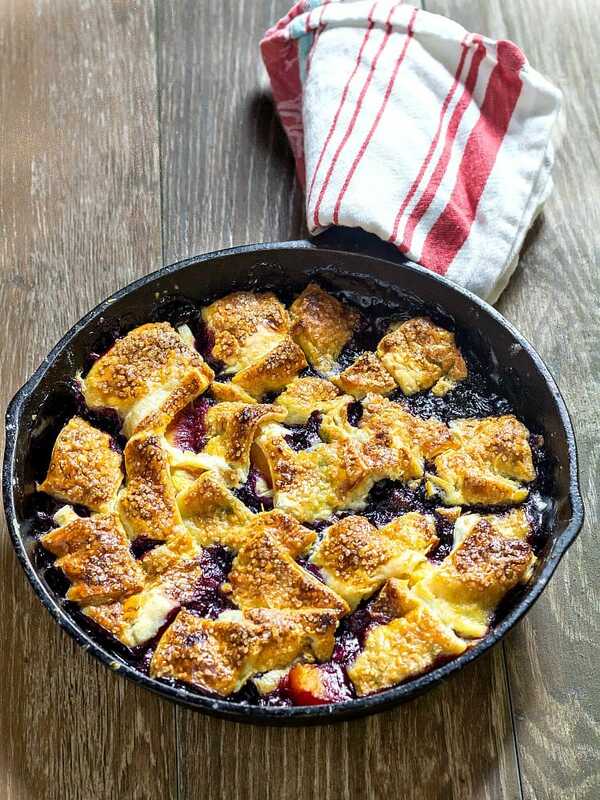 blueberry peach pandowdy. I think you’re going to love it! Thanks for spending some time with me today. Take care, and have a lovely day! Thanks for hosting us this busy time of year, Jenni! Pandowdy is now of my must make list—the combination of blueberry and peach looks incredible!!! Thanks for teaching me about Pandowdy. I kept wondering what this thing was you were making! Looks absolutely delicious. and thank you for a wonderful theme! I LOVE Pandowdies and your combo of peach and blueberry has me salivating dear Jenni! Stunning photos, delicious recipes, and one heck of a theme for our #ProgressiveEats. You hit it out of the park this time my friend (as you always do)! Thanks so much, Jane. You are too kind. xo I have been wanting to make a pandowdy for awhile now. Box: checked! 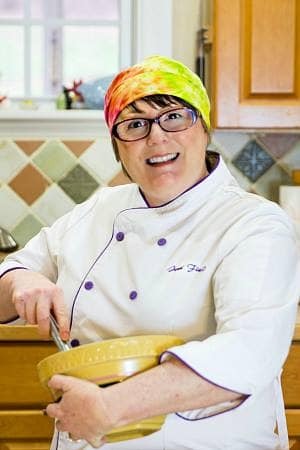 I actually thought of you and your gorgeous Colorado peaches, Barb! You must make this when your peaches come in! And I honestly wasn’t sure tucking some of the dough down in the fruit before topping with more crust and baking would work, but those guys ended up like little fruit-poached dumplings. Lord, it was so good!